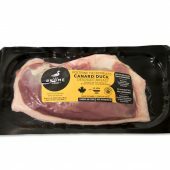 Remove skin and fat from each duck breast. Without losing too much meat, remove the silvery fibre that covers the breast. When this operation is completed, take two bowls that fit into each other and fill one of them of 1/3 full with ice and cold water. On a cold cutting board, cut the breasts into small cubes measuring 0.5 cm and immediately put in the empty bowl. Place the bowl into the bowl filled with water and ice. Place in freezer until serving. Peel and cut the Jerusalem artichokes, the apple (place the pieces in the bowl of cold lemon water to keep them from going brown), garlic and finely chopped shallot (2 mm). Grate the ginger very finely. In the duck fat, brown the Jerusalem artichokes over medium heat. Add the apple pieces and cook until the apple is tender. Add garlic, shallot and ginger and cook for 1 minute. Add the maple syrup and reduce. Season with fleur de sel. Cool as quickly as possible. Put the egg yolks and mustard in a bowl and beat well with a whisk for 30 seconds. In order for the mayonnaise to emulsify, slowly drizzle the oil into the mix while whisking constantly. Once it is emulsified, add the lemon zest and juice. Place in freezer until serving. To serve, finely chop the chives and cilantro. In a cold bowl mix together the duck, apples, Jerusalem artichokes, chives and cilantro, fleur de sel, pepper, Tabasco sauce and mayonnaise. Mix well and serve on toasted bread as hors d’oeuvres, or as a main course, accompanied with a fresh salad and croutons.